To welcome pro football back to Los Angeles, we created a signature California Dog to honor the Rams return! Here’s to a winning season! In a small mixing bowl, mash the avocado with the lime juice and season with salt and pepper. In a separate bowl, combine the black beans, corn, tomato, green onions, red onion and olive oil. Season the salsa with salt and pepper. In a plastic squeeze bottle, combine the Crema and chopped cilantro and shake to combine. Place the beer in a saucepot with the hot dogs and bring to a boil. Reduce the heat to a simmer and cook the hot dogs for 5 minutes until heated through and plump. Warm the hot dog buns. 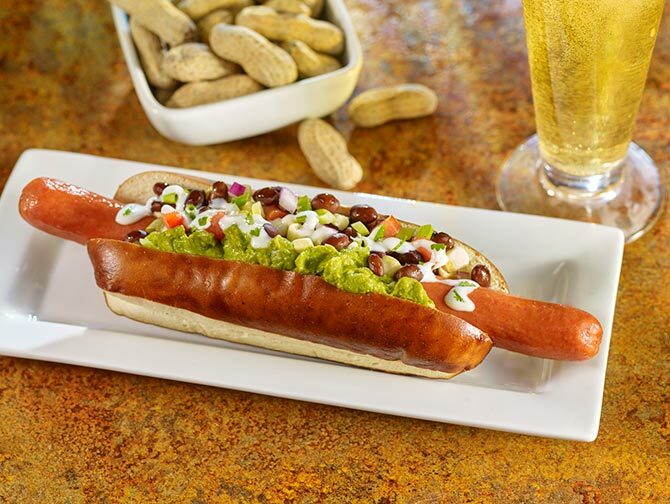 Place a hot dog in each bun and line one side of the dog with a spoonful of the black bean salsa. Spoon the avocado mash on the other side of the hot dog. Top with a drizzle of the cilantro crema.